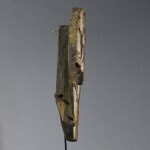 This is a fine, old and unusually well-preserved mask from the Teke or Kidumu people and it derives from the upper Ogowe region. Many years of use has made its mark in terms of wear and tear, insects and weathering without losing its charm and strong artistic expression. 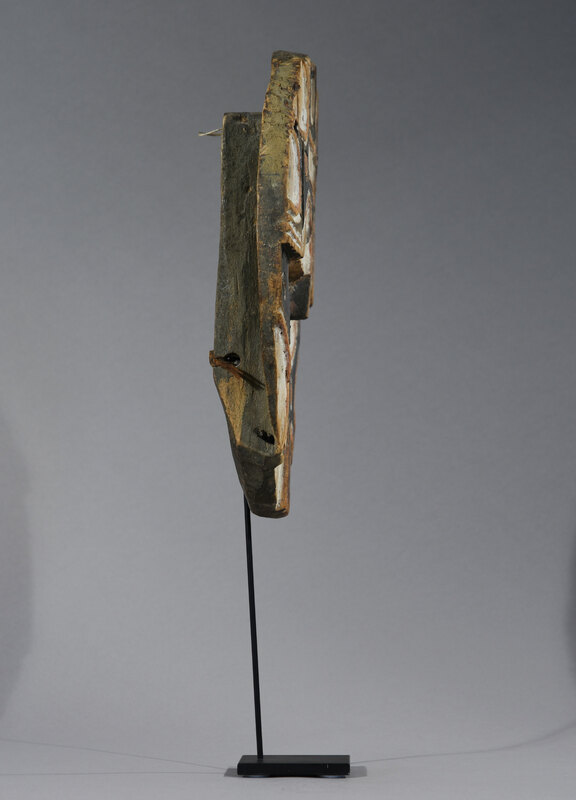 Teke masks are mainly used in traditional dancing ceremonies such as weddings, funerals and initiation ceremonies of young men entering adult hood. 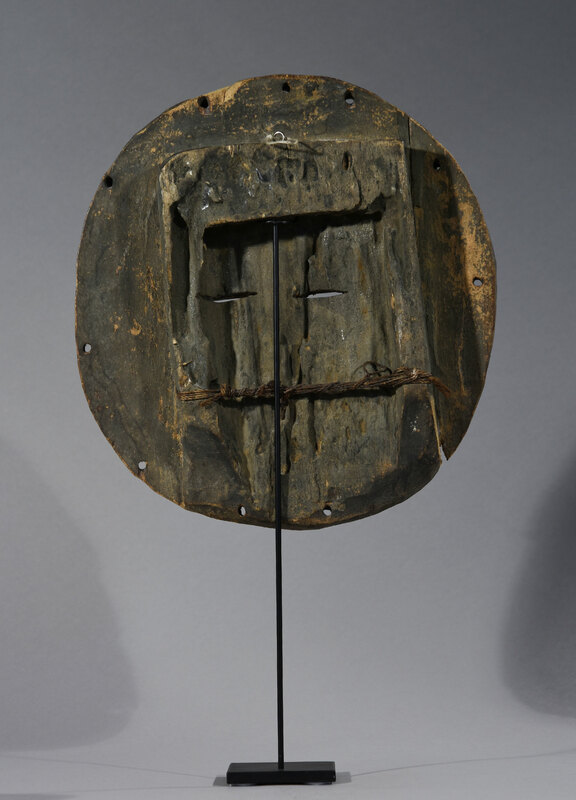 The mask is also used as a social and political identifier of social structure within a tribe or family. 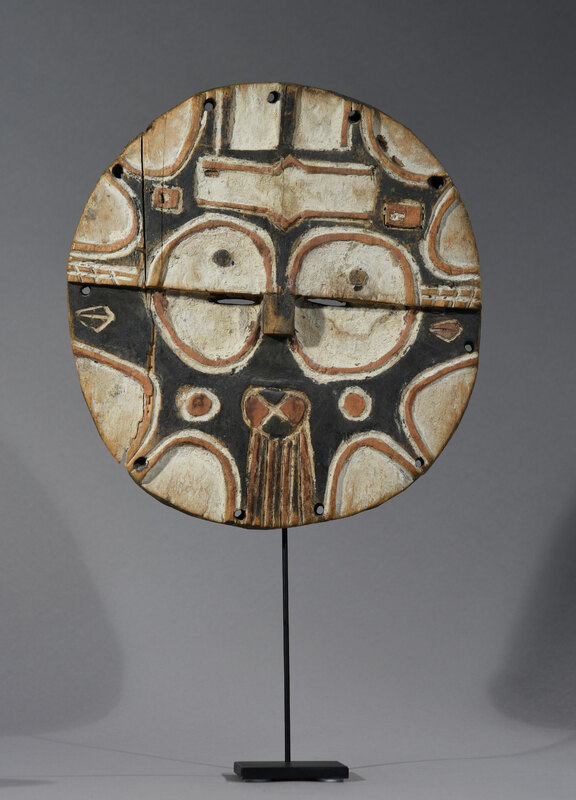 The Teke or Kidumu] people are well known for their Teke masks, which are, as you can see, round flat disk-like wooden masks that have abstract patterns and geometric motifs with horizontal lines painted in earthly red, black, brown and yellow colors. 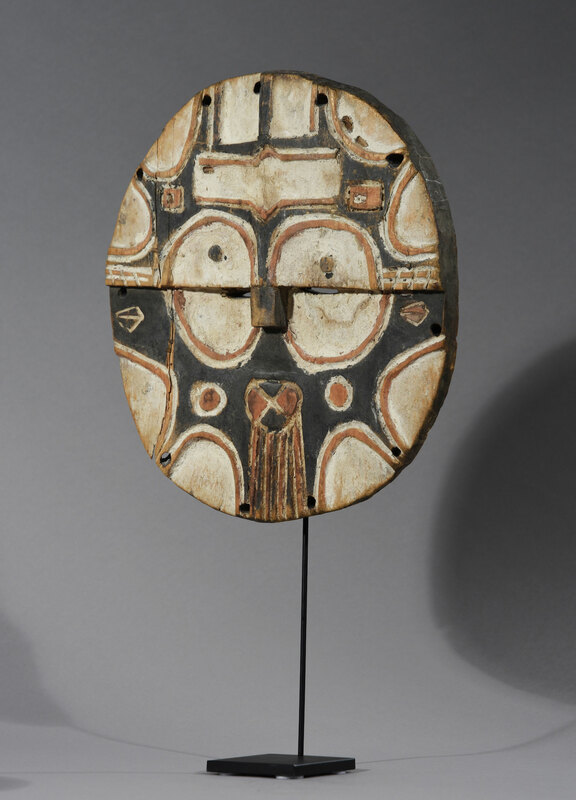 Like many traditional Teke masks it has a small, square shaped nose. 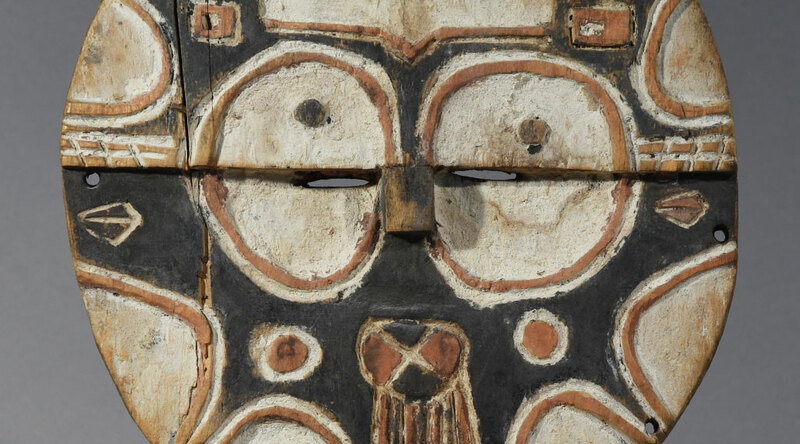 The masks have narrow eye slits to enable the masker to see without being seen. The holes pierced along the edge are for the attachment of a woven raffia dress with feathers and fibers. The mask is held in place with a bite string at the back that the wearer holds in his teeth. The dress would add to the mask’s costume and conceal the wearer. The Teke people (or Bateke in the plural), are a Bantu Central African ethnic group that speak the Teke languages. Its population is situated mainly in the Democratic Republic of the Congo, the Republic of the Congo and with a minority in Gabon. Omar Bongo, who was President of Gabon in the late 20th century, was a Bateke. The name of the tribe shows what the occupation of the tribe was: trading. The word teke means ‘to buy’. The economy of the Teke is mainly based on farming maize, millet and tobacco, but the Teke are also hunters, skilled fishermen and traders. The ‘mfumu’ was the head of the family and his prestige grew as family members increased. The Teke sometimes chose blacksmiths as chiefs. The blacksmiths were important in the community and this occupation was passed down from father to son. In terms of spiritual life of the Teke, the village chief was chosen as religious leader, he was the most important tribal member and he would keep all the potions and spiritual bones that would be used in traditional ceremonies to speak to the spirits and rule safety over his people.